I’ve been hearing it again lately, the utterly false contention that June is a shoulder season for fishing. Ever since 1993 when my father, brother, cousin Jim and I went fishing on the May long weekend not far from Vancouver and caught enough chinook salmon to feed 150 guests at our old-fashioned wedding reception the following week, I have looked forward to getting back out on the water as early in the year as weather permits. Sadly, the Straits of Georgia and Juan de Fuca don’t produce nearly the numbers of fish they did back then, but the waters of Haida Gwaii still do. And so once again this year, I plan to be among the enlightened on those majestic seas in early June. 1: Why wait any longer? Winter is long in many parts of North America, and for anyone who likes to fish, or who simply has an appreciation for the unparalleled beauty of the lands and seas of Haida Gwaii, why the heck would you wait any longer to get there? The fish won’t. The summer solstice, June 21, is quite possibly my favourite day of the year, and nowhere more than in the northern latitudes. I feel inordinately privileged to be in the marine wilderness of Haida Gwaii when summer is at her astronomical peak. And I have a particular fondness for sipping a digestive elixir whilst looking out on the waters off Langara Island or Port Louis while the sun is still casting her glow, or fishing on dead calm water in broad daylight at seven in the morning. A calm and sunny June morning at The Outpost. 3: The commercial boats haven’t moved in yet. No further explanation required for this one. I should say though that even when the trawlers do move in, DFO regulations prohibit them from broaching the one-mile offshore boundary. Still, there is a certain smug satisfaction seeing them idle at anchor in a sheltered bay in early June waiting. 4: There is bait, and there are fish. The herring bloom takes place in late winter and the offspring are in peak numbers by late April. 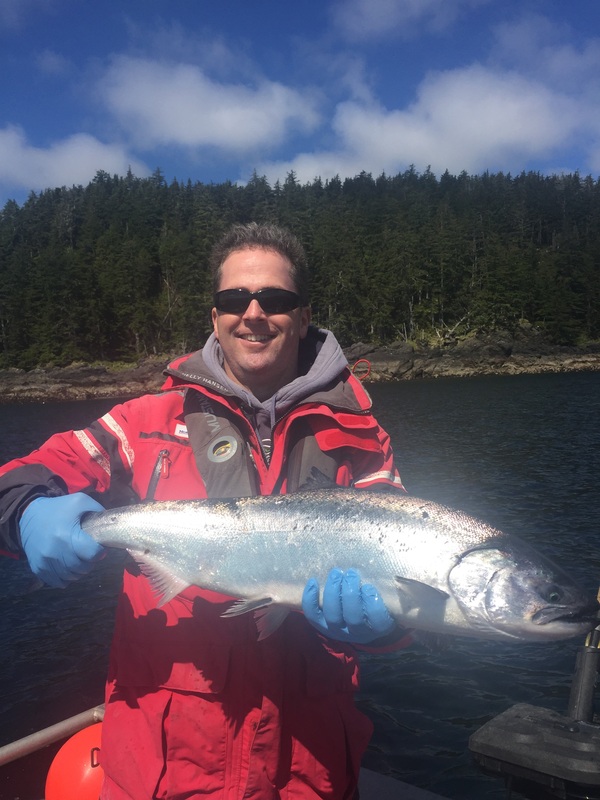 Although the coho tend to take their time getting to the dinner table, June is well within the time of the migratory feeding patterns of chinook salmon, and Haida Gwaii is the first stop on their southward journey. This includes big fish. 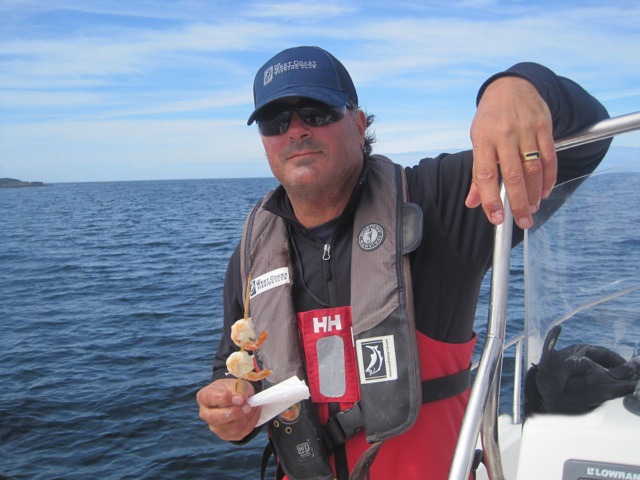 Trust me friends, I have seen tyees caught within the first hour of opening day, and many, many have been caught (and thankfully released in most cases) north of 40 and even 50 pounds in June. And then there’s halibut, which by June have moved in from deep waters onto the continental shelf. Come to think of it, I can recall a particularly memorable trip to The Outpost for my brother-in-law and me in June of 2013, with double headers on every shift and minimal effort required to find perfect turkey-sized halibut. The experience was a bit of a spoiler though, and I have since had to remind myself that it is unrealistic to expect that kind of fishing every time, but one can always hope! 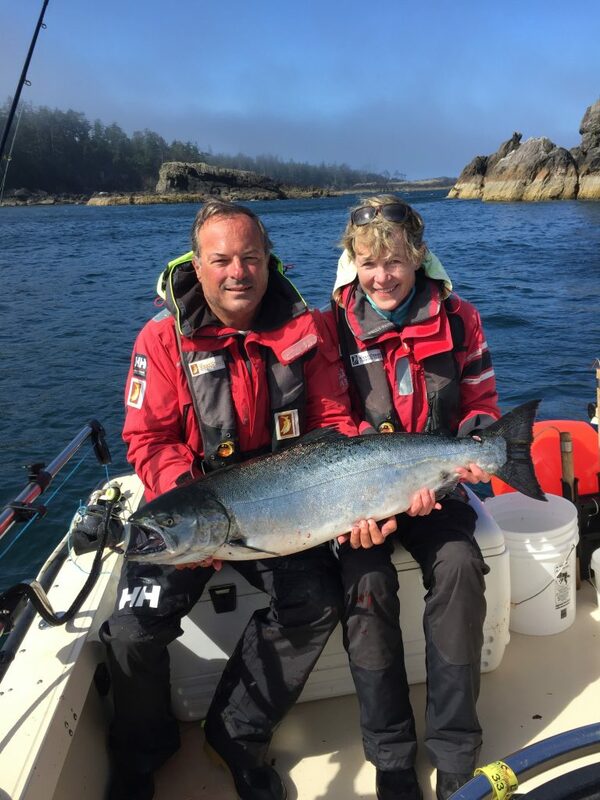 Deepwater Don with his wife, Kim enjoying a sunny productive day with a classic June chinook. It takes a while for winter to release its icy grip in the north, but when it finally does, everyone comes out to play. Black bears come down to the beach to look for shellfish at low tide (watch for them on the chopper ride or, when fishing the north shore of Graham Island, on the beach of aptly-named Bruin Bay). Eagles will be soaring overhead looking for easy morsels too, or plucking live fish off the surface in dramatic aerial attacks. Orcas (killer whales) are by now hunting the salmon that are hunting the herring. 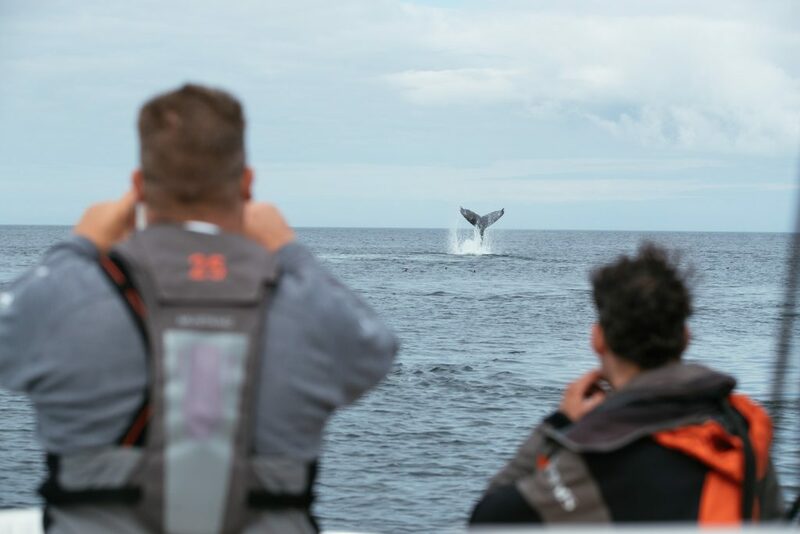 Humpback whales, those lovable gentle giants, cruise about in an unthreatening manner, occasionally thrashing the surface with a fin to stun the baitfish, or flipping up their fluke as they initiate a dive. And if you are really lucky, you’ll see one breach like a launching rocket in a scene you will never ever, ever, forget. Whale watching at it’s finest. Dave Matuschewski showing off a nice chinook. 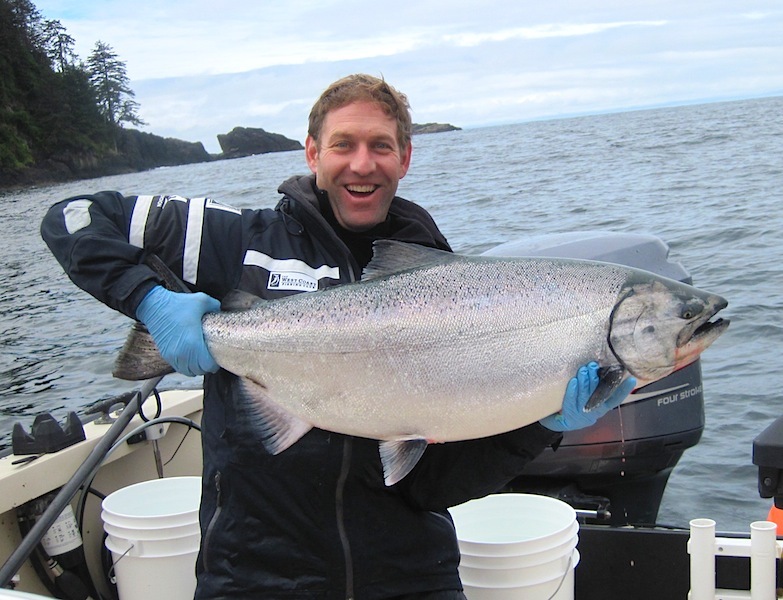 Ken Beatty is all smiles with his 52.5 lb tyee that was caught and released within sight of The Outpost. I have fished at The Clubhouse every year since 1997 and I love fishing in early June. 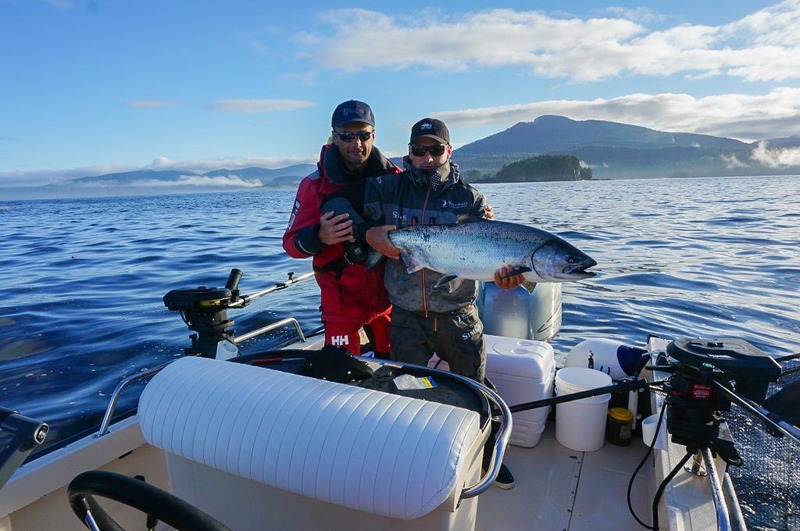 We’ve enjoyed large tyees, great halibut fishing and unbelievable scenery. Great fishing with incredible wildlife experiences enjoyed by everyone in our group. 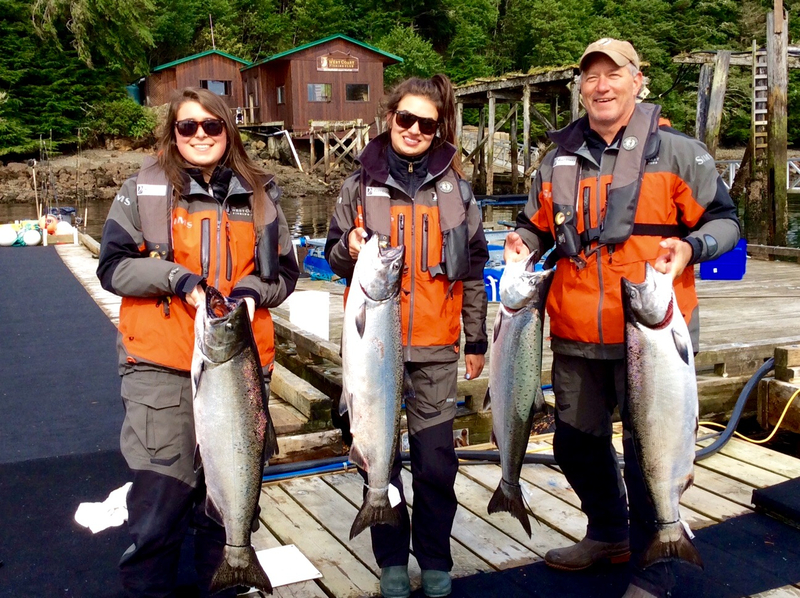 Long-time guest, Greg Garske showing off his catch with his daughters. Call us at 1-888-432-6666 or click here to make an inquiry online and you’ll be contacted within 24 hours.